Hi Mom! Happy Mothers Day! How are things in Iowa? 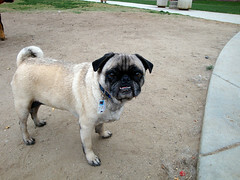 Here’s a recent picture of me at the dog park. You can see I have an underbite just like Dad. Some people tease me about it but I don’t care. You would be so proud of me. I’m the alpha dog of my whole neighborhood! People think that dogs don’t remember their families but of course I remember you and I always love you even though you’re far away.